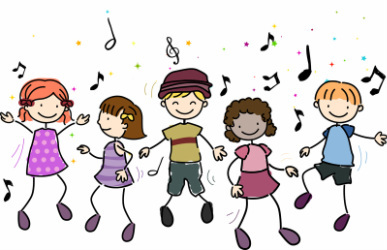 Parents, ask your child to sing or play a song they have learned in their music classes. Students in Kindergarten are busy learning new songs and musical elements, including beat, melodic movement, dynamics and tempo. First grade students are continuing their study of musical elements, working on strong beat, rhythm, and instrument tone color. They have been trying their best to be good "Sound Detectives" as we work on identifying classroom percussion instruments by sight and sound. We are also working to build up their musical literacy by striving to use musical vocabulary during class discussions. Students in the second grade classes have been singing songs about fall seasonal celebrations to build their knowledge of musical elements, note values and literacy. We even made "Witches Brew" for Halloween! Third grade students have been busy preparing for their Winter Concert in December, while still taking some time out for songs about the fall season and playing instruments such as the autoharp. Don't forget to mark your calendars for the VES Winter Vocal Concert....December 10th @ 7:00! Fourth grade students have been brushing up on their musical skills. From playing rhythmic combinations along with Pachabel's "Canon in D" to creating and performing their own rhythm and melodic compositions, these students are definitely demonstrating that they've "got rhythm". Students in fifth grade have been trying out their skill of playing and creating melodic ostinato patterns to accompany songs like "In That Great Gittin' Up Mornin'". They have been doing a great job of putting their prior knowledge and skills to work and demonstrating good teamwork and effort.